One of the main things you need to know about me is I love stationery. I have a weird thing for planners, I get excited over washi tape and I am the queen of sticky notes. I am also a hoarder of notebooks. I've always found joy in buying a new notebook, ever since I was at school and had pocket money to buy all the supplies I needed. Now it's very much about WANTING. I make notes on my phone if something pops in my head (mainly shopping lists) but I like having a good notebook to hand for work planning, blog planning, life planning... I do love a good list! I'm also known to be a doodler. Nothing particularly impressive - mostly lines, swirls, stars - but if I have a pen in hand, I mean to use it. I've loved seeing the adult colouring trend come in and so many great books out there. Who says colouring should just be for kids? 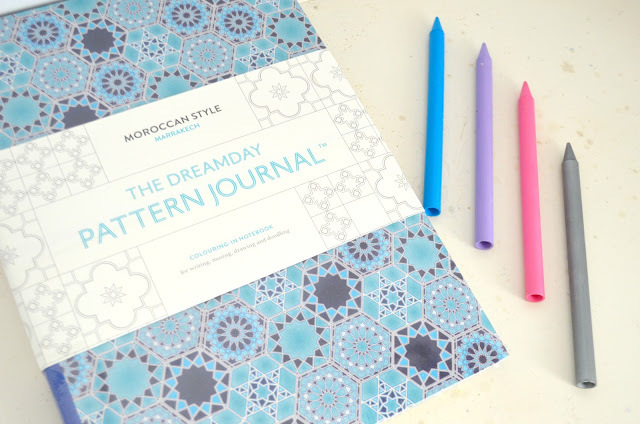 It's meant to be really therapeutic and whilst I don't know if I would sit down and colour in a full page, I've discovered something that appeals to the stationery geek and novice doodler in me. 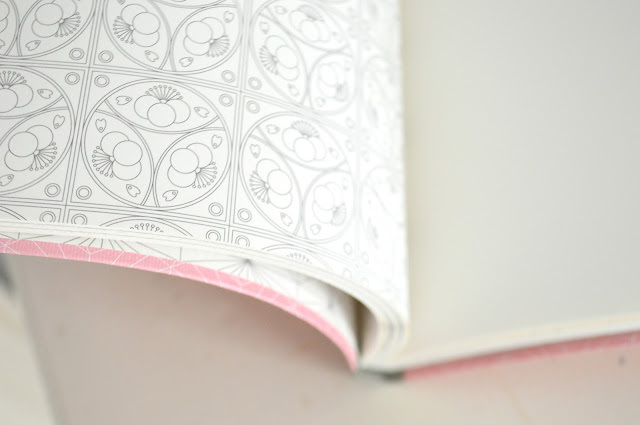 Part pretty notebook, with lovely creamy pages, part adult colouring book, with intricate patterns to colour in 'til your heart's content. Published by Laurence King, and priced at £10.94 each, these journals are 100 pages long, have uncoated ivory paper (love) and combine plain pages for practical note making with pages of pattern outlines so you can doodle and colour away. 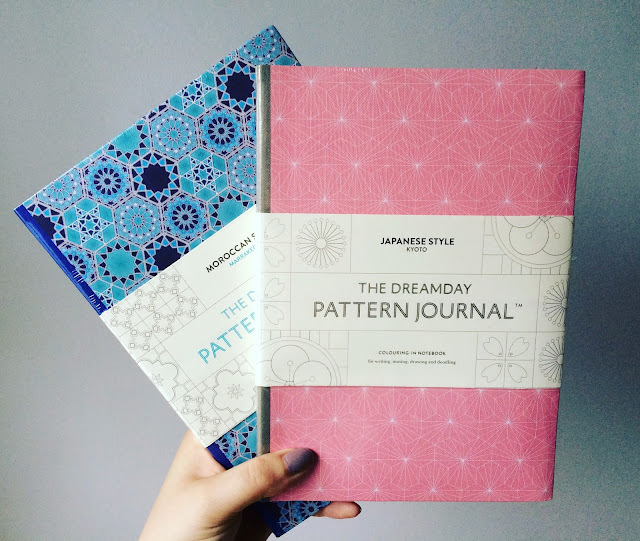 I have two of the new pattern designs - Kyoto and Marrakech - and love them both. The covers are really attractive, the paper is good quality and feels nice to write on and I like the way the patterns are interspersed throughout. The pattern outlines are quite intricate and small in places making it really good if you like details and enjoy colouring inside the lines. Which design would you choose to doodle in? * Note: I was kindly sent two journals for the purposes of this review, but my enthusiasm is genuine. We're a close family, us three bears, and we spend many weekends with it being just the three of us. During the week, it's nearly always just us and we have a nice routine going. 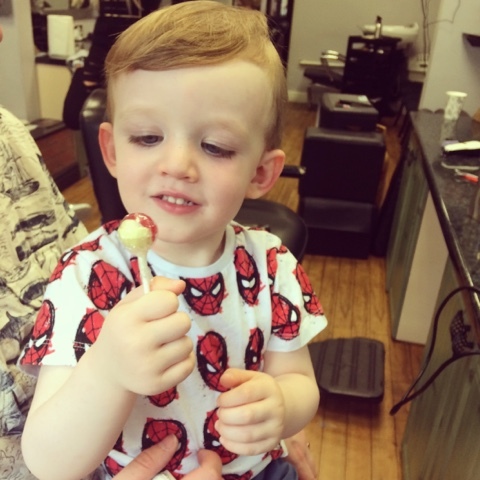 Ethan's over three now and becoming so grown up that he's involved, or aware of, most things we do and it's nice to have the company and also a small pair of hands that can help out here and there if we're sorting laundry or putting toys away - if he's in the right mood, of course! 6am - alarm goes off. One press of the snooze button, and I'm up (ok, maybe two snooze buttons. Three, tops). I plod downstairs in search of tea and feed the cats, check my phone (which I now leave downstairs overnight to avoid distractions before bed) then head up to the bathroom. 6.30am I then settle myself at my dressing table, put the lamp on, and get myself ready, doing my make up whilst watching my iPad, followed by drying my hair and getting dressed. At some point during this, hubs emerges and starts his morning routine, which often includes ironing something for me (he's a sweetheart like that). I then head up to wake Ethan and get him ready. It's hit and miss as to whether he complies. Some days, he's in a great mood and we get all the way through the routine without a hitch. Other times, he falls at the last hurdle (having his teeth cleaned). And sometimes, there's a full on breakdown because I've picked out the wrong pair of shorts. 7.30am (if we're lucky... or 7.45am if I'm honest) We all scramble into the car and head to preschool. Most days, Ethan's fine and goes and helps himself to breakfast. Some mornings, he doesn't want to let me go. We sometimes grab a soggy piece of complimentary toast before we head off to the city to go to work. 8.20am I drop hubs off in town - as close to work as the traffic allows. I then drive a further five to 10 minutes to where I work to start my working day. A few emails, a few calls, some meetings, some writing - no two days are ever really the same. 4.50pm Home time! I jump in my car, putting my laptop and handbag in the bag, then head into the city rush hour traffic, picking hubs up en route back to the nursery. Everyone is even more impatient on the return journey. 5.50pm We finally get to Ethan's nursery, with 10-15 minutes left before they close. We go through to his room and peek around the corner to see where he is and what he's doing. I've always done this, as I love trying to get a glimpse of my son when I'm not around and he has his friends to play with and talk to. I just love watching him. He soon spots me, shouting 'Mummy! ', dropping whatever is in his hands and running to us, arms outstretched. 7pm I pass dinner over the safety gate to hubs then go and get my own. Ethan immediately charges over to my seat on the sofa and I spend the time trying to eat a mouthful of food whilst at the same time, Ethan tries to put his fingers in my food. 'Mummy, can I try it?'. 7.45pm Bath time! I go up and run him a bath then when it's the right temperature, hubs brings him in. He demands his bath toys and then plays for a good half hour. We don't bathe him every night, as he has sensitive skin, but he enjoys it when he's in the tub. 8pm Shrivelled like a prune, we get Ethan into his PJ's, comb his hair then one of us hugs him goodnight. It's then potty, a quick brush of the teeth and a sticker for being good before bed. Hubs and I have been taking turns at bedtimes since he was around 18 months old. Whoever is on duty sits on the chair in his nursery, reads as story of his choosing, plays music and does their best to get him to settle down. If it's hubs' turn, I come downstairs, tidy away those jigsaw pieces and trains, make myself a cup of tea then settle down to do something for me; be it watch something I can't around Ethan (Orange Is The New Black, at present) or read a book, catch up on blogs, put the laundry on to dry - whatever needs doing. If I'm being good, I'll prepare our lunches for the next day (who am I kidding? I've done this once in about three months). 10pm Snoozeville, or at the very least, I go up to bed. It won't take me long to drift off to sleep. Minutes really. And Ethan will sleep through (touch wood, a mid-night wake up hasn't happened for a while now). We're starting a new routine though, this week. We're keen to do more and break with our usual habits. Some days, I'm tired and too lazy to make the meals I really want to make or to do anything more than watch Netflix. 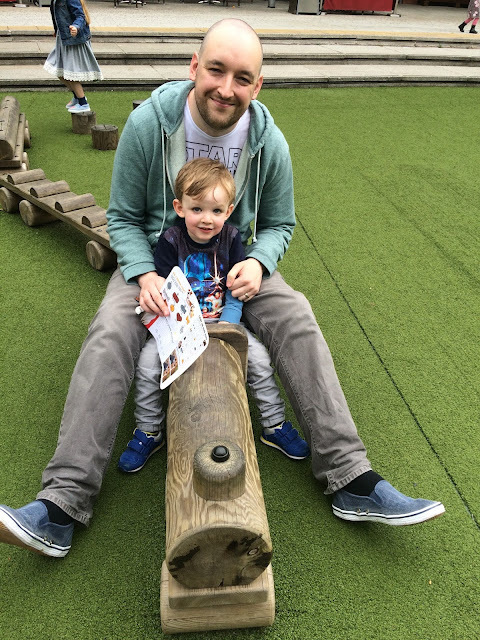 Hubs and I both want to be more active - for our physical and mental wellbeing, to make time for ourselves as well as together, as a couple and a family, and to set a good example for Ethan. Now he's that bit older, we can do more during the week if we really want to. And we do. So, we've joined our local David Lloyd. We never knew we had a health and fitness centre so nice and so close to us; it's midway between our house and Ethan's nursery and it's really nice inside, with plenty of facilities, a nice feel to it, a club house, a soft play area and even an indoor and outdoor pool. We discovered it when taking Ethan to a party there a couple of weeks' ago and popped back to take a look around. There's plenty for Ethan to do, from mini football to creative classes and of course, swimming, and classes are timed so we can drop him at something then head to a class of our own, or just to the jacuzzi / steam room / pool / gym. For us, it's not about just joining a gym. It's about giving us some freedom and enhancing our lifestyle. Genuinely, it may sound corny, but it is. It's a nice place for us to go and spend time together, or separate. I'm going to do yoga again. Ste is going to focus on weight training. Ethan's going to have a kick around. It's going to give us some new, good for us habits. My plan is to do one class, one swim and one gym session a week. That's a lot, going from nothing, and some weeks, we may go even more. There's always something on and I like the flexibility of planning what works with the rest of our schedule. When it's our night off bedtime duty, that gives us some personal time, and at weekends, we can all head down. A new routine is born. Our kitchen is the smallest room in the house. It's also the darkest. At the back of the house, it receives some sun first thing but because it's small and narrow, with just a frosted window and a glass panelled back door, it doesn't get a great deal of light. We're planning on having the current overhead lighting replaced to try and eradicate the dark corners and we'd love to have a new kitchen, but for now, we're working with what we have. I like the black and white backdrop but wanted to update the room on a budget to give it a new lease of life. Retro styling. I have a few postcards of food ads of yesteryear and similarly styled tins too, plus I have a love of all things vintage. With the black wall tiles and white units, I had an American diner type look in mind. 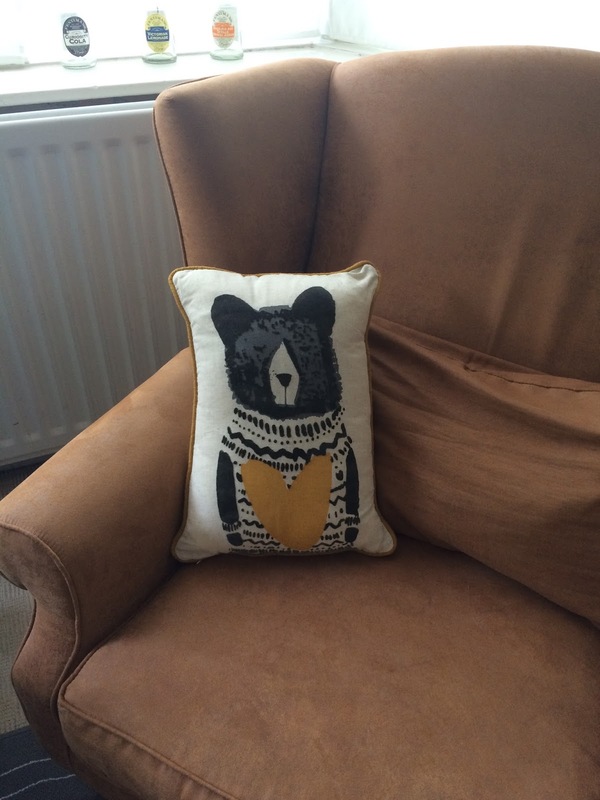 I started window shopping online and soon found that Dunelm Mill had just the thing. We've had the same kettle and toaster for more than 10 years (a great testament, in fairness) but as they sit on the counter, taking up valuable space, I wanted to replace them with more attractive alternatives. 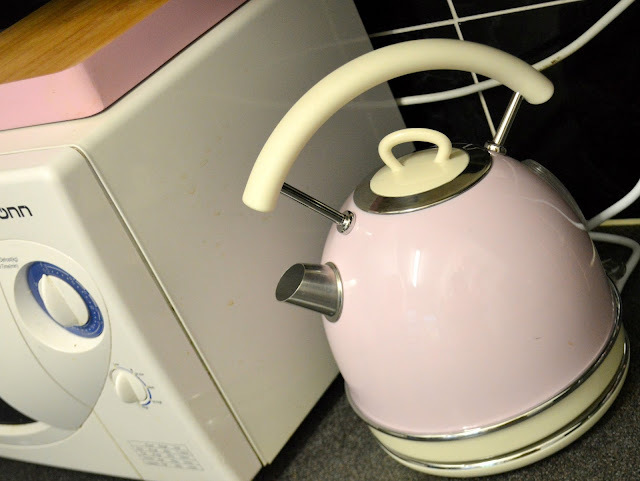 So, I settled on the Candy retro collection of appliances, and some accessories, and in store chose a mint toaster, a pink kettle and a duck egg blue bin to match in terms of style. 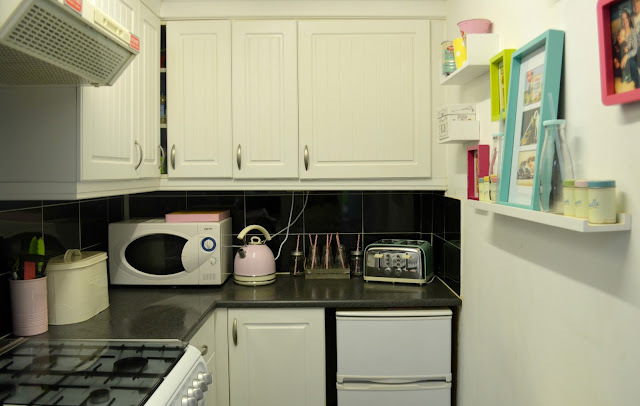 I like to mix and match more than have everything same-y; I thought that in such a small space, a pink kettle, toaster, bin and microwave would be too much, plus hubs wouldn't be so keen on so much pink (and I couldn't not have one of the pink items as they're too darn cute). 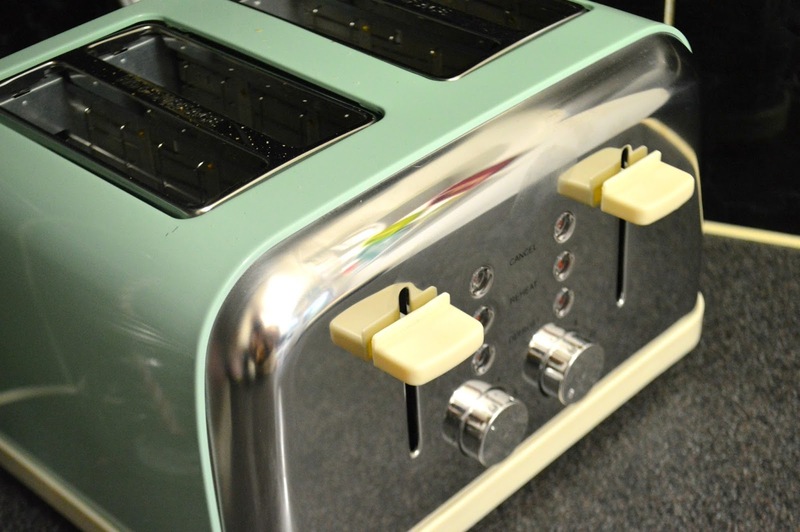 I'll be adding a duck egg blue microwave to complete the look this weekend - as again, our current model has seen better days but has served us well. 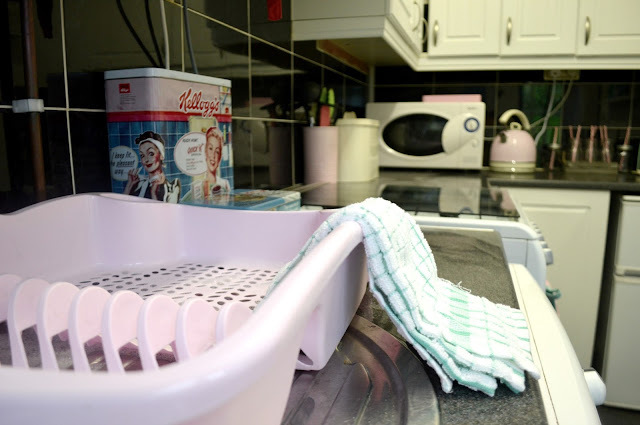 I then had a look around to find some other bits and pieces to give the kitchen a quick update; tea towels, oven gloves, a new chopping board and even a new dish brush can all add accents around the kitchen to give it a fresh new look, and are cheap additions too. I picked up the wood chopping block with pink painted trim for just £3.49 and the large dish drainer for just £2.99, all Dunelm. If I hadn't already had a bread bin, utensil holder and biscuit tin, I saw the perfect retro set in Wilkos for just £12 when buying the bunting (just £1.50). I found some narrow floating shelves (set of three for just £7.99) and back at home we fixed these to the wall, along with a previous picture shelf from Ikea, to make a display wall. 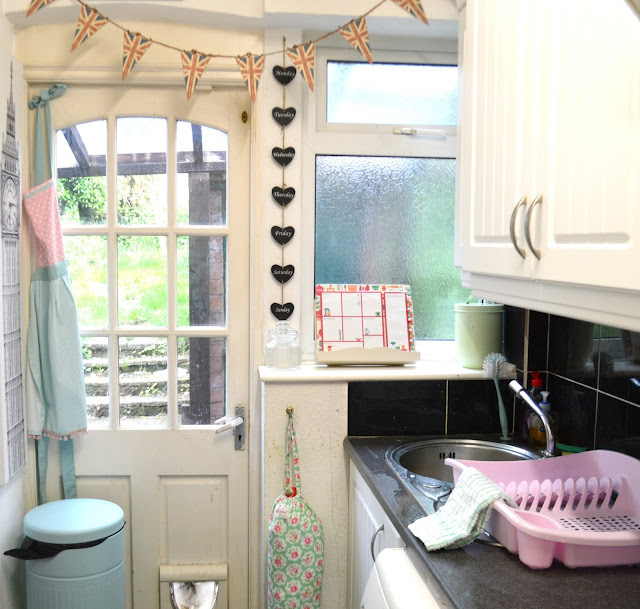 I popped a couple of my Cath Kidston mugs on display plus a few baking accessories I picked up a few months ago. 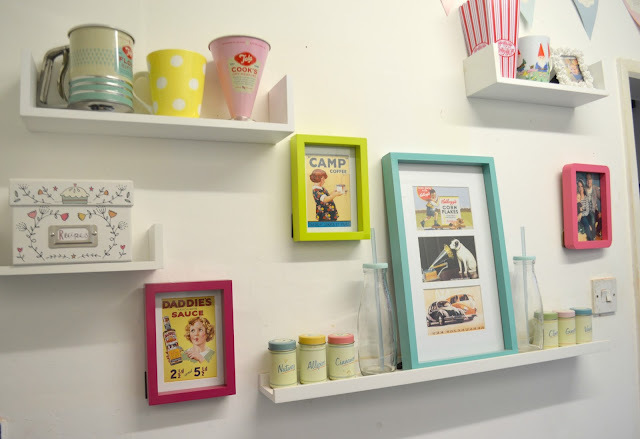 I brought together my retro tins and prints, plus my mini milk bottles from Asda, and rearranged these to bring the whole look together. It hasn't made the room any bigger but it has made it feel brighter and more fun. The new appliances look great and we're so pleased with the wall display too. The retro styling looks great and I feel much happier spending time in there now. 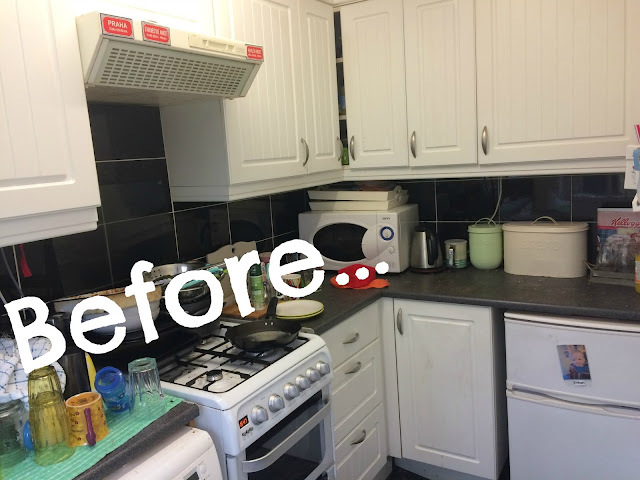 The whole update cost just £80 (with a further £43 for the microwave I'll be picking up this weekend) and has made a real difference and goes to show a room makeover can cost a lot less than you think. * Collaborative post with Ocean Loans and their Dream Rooms campaign. I received a voucher to make my makeover plans come true, which in part paid for our new kitchen accessories. All views and content remains my own. 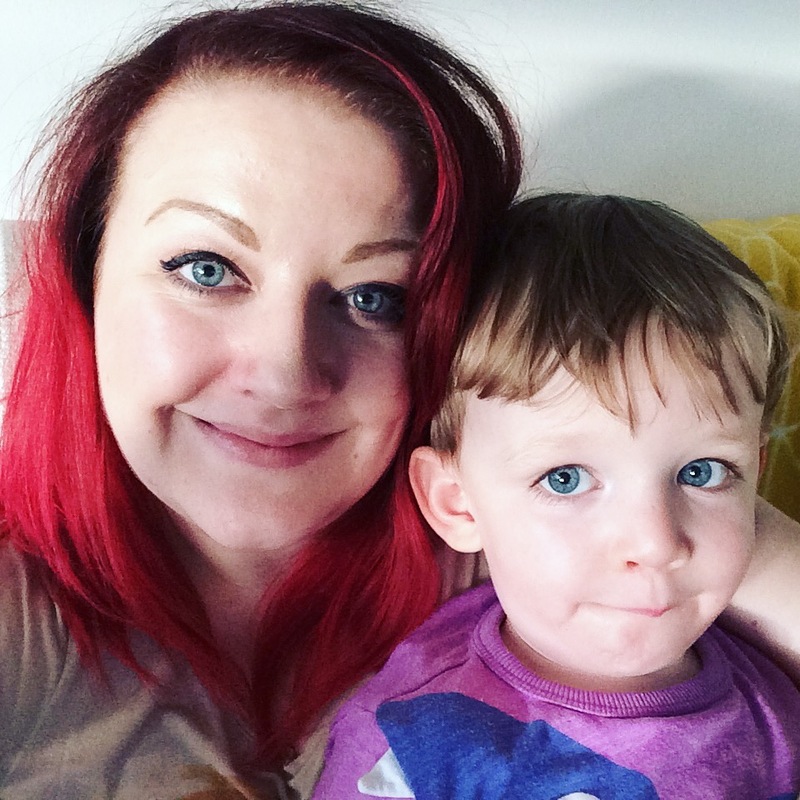 For a while now, Ethan has given me the nickname Mummy Bear, with hubs naturally as Daddy Bear and Ethan of course as Baby Bear. I think it first came about because he'd been reading Goldilocks and the Three Bears at preschool and the names have really stuck. We're a merry little bunch. Daddy has his chair. Mummy has hers. Ethan has his own table and chair too. We've had some really good quality time together recently and hubs and I are really enjoying the just-turned-three stage. He's got such a personality and the things he comes out with - honestly, I wish I could remember them all to write them down, but there's just so many funny comments he makes or stories he recites. 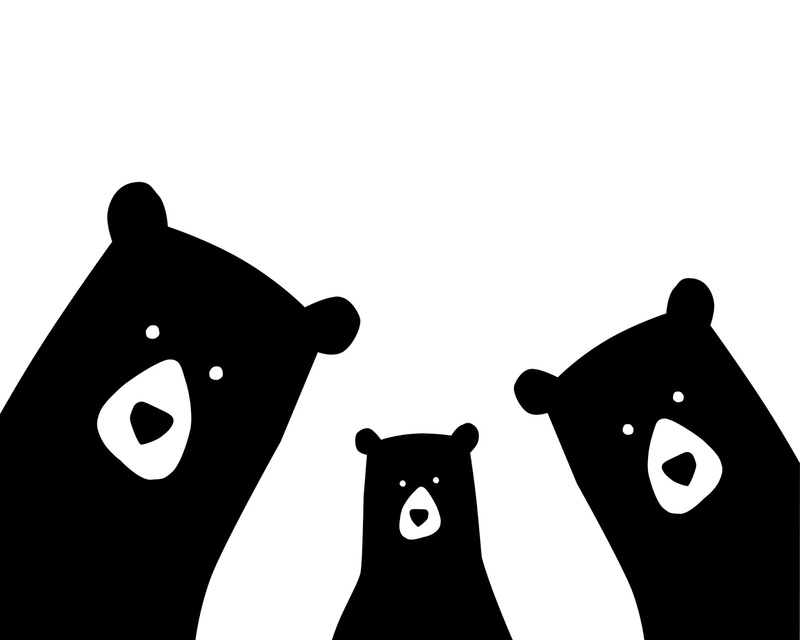 We're in a really good place at the moment, us three bears. He may have his moments - ridiculous breakdowns over tiny things that are resolved as quickly as they start, negotiating how long he can stay up for or how many biscuits he can have - but Ethan is just the best company. We all love our cuddles. Ethan is incredibly affectionate lately. He's always been close to us but he's constantly telling us that he loves us at the moment, "with all my heart" and "so so much", and he's very generous with cuddles and kisses. We give each other 'squishes' (one of our nicknames for him is squishy) and we are all very happy in each other's company. He's at such an age now that we can really do things together; it's not just about us all doing separate things. He's bigger, more active and understands so much that we can leave the house, get the shopping in, go out for the day and Ethan looks after himself, helps us out and involves us in what he's doing. We're joining a local health club at the end of the week and this has very much been a family decision, for us all to do more and be healthier and happier all round. I'll share more once we are fully signed up. I went with the three bears theme for Father's Day, choosing a card, a print (as pictured at the top) and a cushion for Daddy Bear's chair. We've got a couple of weekends with friends coming up now, for hen and stag parties, so the three bears will be the two bears for a few days, but that's ok. We're the three bears and nothing will change that. 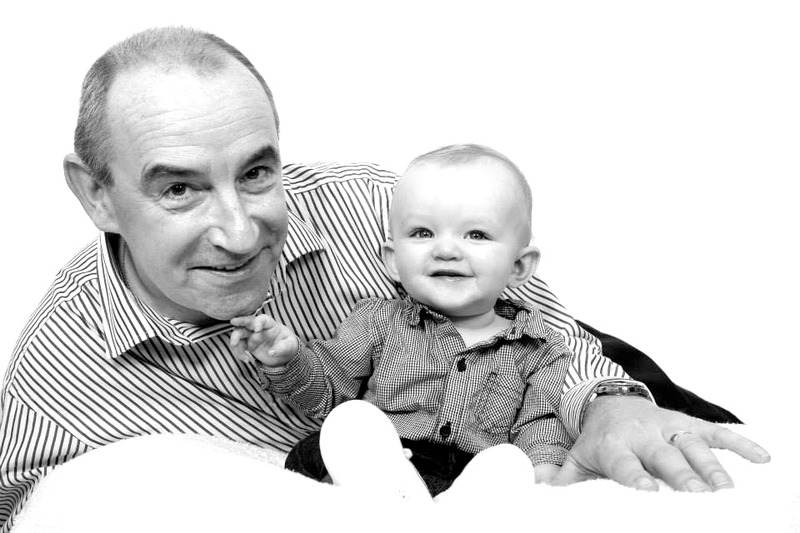 Thought fundraising was just for grown-ups? Well, since 1997, children's charity Barnardo's has hosted the Big Toddle event - a series of sponsored mini walks up and down the country for under 5's to get involved in, all for a great cause. It's not something I've really been involved in before but it's such a nice idea and sounds like a lot of fun for little ones. 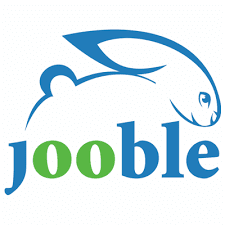 There's a list of locations where Big Toddle events are taking place this year and groups such as nurseries and schools can set up their own events too to raise money for the charity. 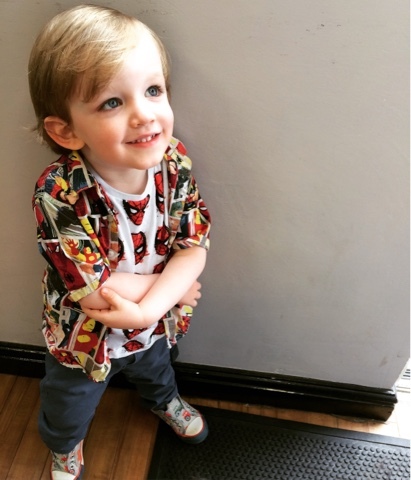 This year's Big Toddle is sponsored by Aldi Mamia - a brand that we have come to love - and the team recently sent us a hamper of toddler treats, including Easy Pants to help Ethan with his potty training, to celebrate. The first planned event takes place tomorrow in Belfast with several more over the next couple of months, so it's worth taking a look to see if you can get involved. * Thank you to Aldi Mamia for the toddler supplies! Being Father's Day, I couldn't choose anything other than my three of my favourite photos of my three favourite father figures in my life. 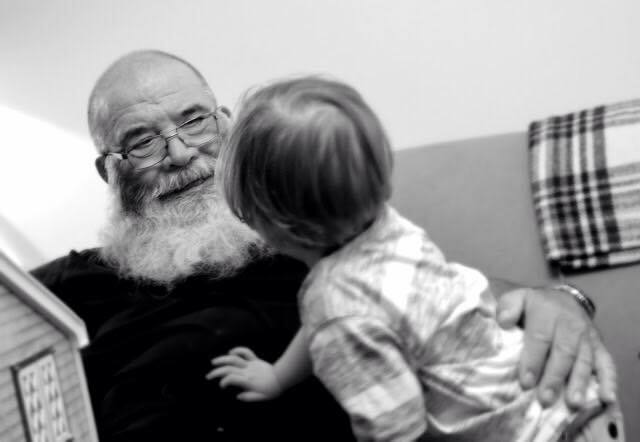 My Dad - a very special person with hundreds of stories to share. Only the best dads get promoted to Gramps. My husband - the best daddy Ethan could wish for, with a toy collection to rival our son's and an imagination and dedication that knows no bounds. My Father-in-Law - the strong figurehead of his family who has such determination even during difficult times and who does everything for those around him. 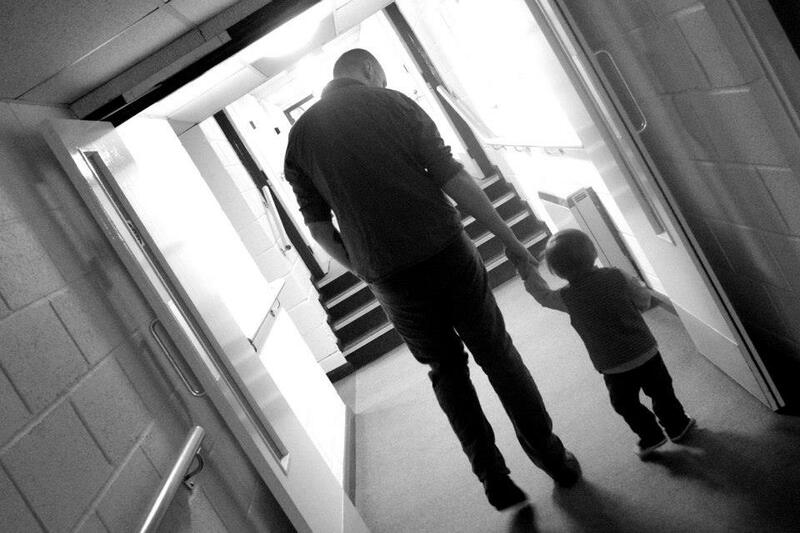 Happy Father's Day to all the amazing dads out there. Ahead of Father's Day tomorrow, I wanted to pop up a quick post as we're currently trying out the DisneyLife subscription (full post on this coming soon) and they've put together a really sweet video to celebrate dads for Father's Day. We're all huge Disney fans in our house and it holds a special place in each of our hearts. My husband has fond memories of watching the films growing up and got to go to Disneyworld several times when he was younger with his family. They're all buffs to this day and share a bond with the magical world that is Disney. I had a couple of Disney films on VHS growing up that remain firm favourites with me today - Aladdin and The Lion King in particular - and having been to Disneyland a couple of times, I'm on the Disney bandwagon big time. My friends are too - so much so, we have assigned princess alter-egos to one another. No kidding - I'm Cinderella, although I asked to change to Rapunzel following the release of Tangled (and with my red hair, I could easily be Ariel too now...!). Ethan therefore didn't have much choice, he was destined to be a Disney kid - but I'm sure he would have been even if it hadn't been for us. 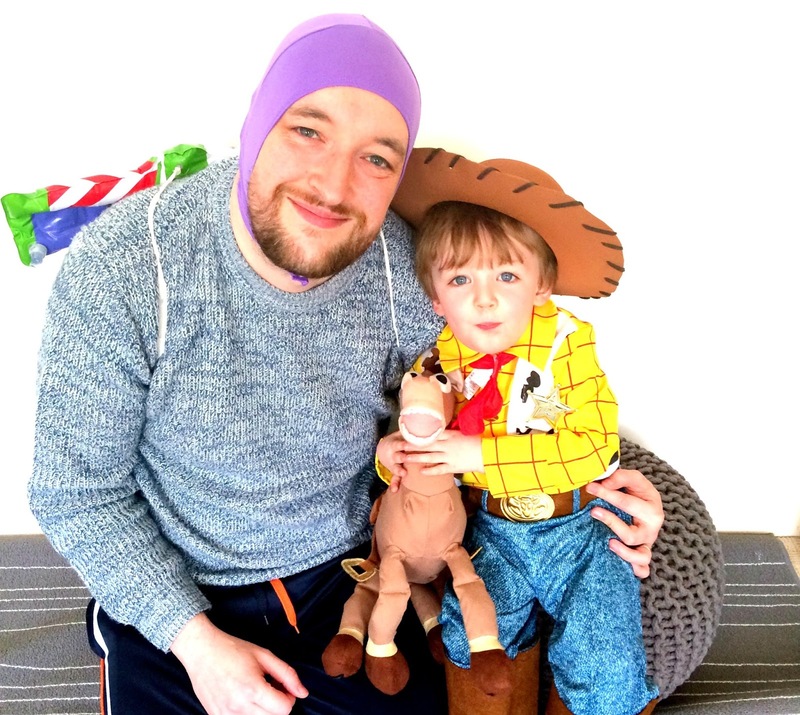 His early favourites being Toy Story and Monsters Inc, I don't think there's a Disney film or character he doesn't like and with DisneyLife, we've been able to explore classics as well as new shows such as Jake and the Neverland Pirates too. Disney is special to us as a family and has been a real bonding moment for Ethan and Daddy. Which is why, when I saw this special video from Disney, featuring their top 10 fathers, I wanted to share it with you. And for one chief lion (hubs) and his little lion cub (Ethan). Who's your top Disney dad? Dads go free at Sea Life Centre Birmingham this Father's Day! 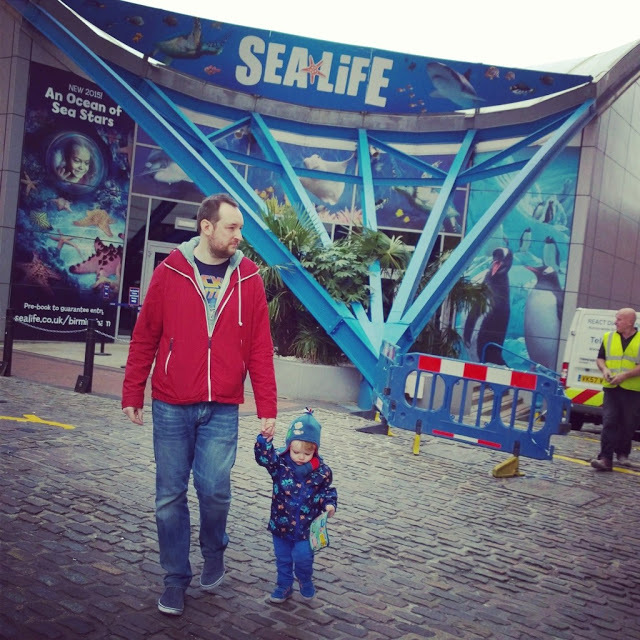 We're a family of animal lovers and we're all very excited about the Finding Dori film coming out later this year, so it will probably come as no surprise that we love the Sea Life Centre. 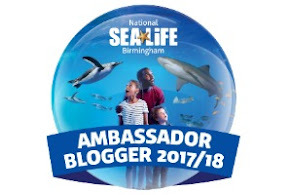 It was fin-tastic (sorry) to find out that I had been chosen to be a Sea Life Centre Ambassador for the year; we've been many times and Ethan gets more and more out of it every time we go. There's lots to see and there's even more to do, with lots of different events running throughout the year - and well-planned around school holidays, so you can get even more out of a visit and keep your children happy... and busy! If you're yet to decide what to do this weekend, then why not consider a visit, particularly if the dreary weather is still with us? The National Sea Life Centre Birmingham this Father’s Day (19th June2016) has said that dads go FREE (with a full paying guest - over three years old). Fun day out and cheap too? Win win! To claim this fab Father's Day offer, you just need to quote the word SEAHORSE at the front desk on the day. Why seashorse? Well, the Sea Life Centre Birmingham is home to a huge variety of incredible creatures from across the world’s oceans, including the parenting champion of the underwater world, the seahorse. Many people are surprised to discover that it’s actually the male seahorse that gives birth to young after incubating the female’s eggs in a special stomach pouch for around 25 days. Even more startling is the fact that several hundred – sometimes up to a thousand – babies can be produced in a single pregnancy. Yowza! This weekend, you can treat dad to a free day out at the attraction and marvel at the incredible variety of seahorses on display - always a highlight for me. The aquarium is also home to over 2,000 creatures, such as sharks, a cheeky pair of otters, an intelligent and playful Octopus, critically endangered Golden Mantella tree frogs, rays, crabs and lots more. The Nemo (clownfish) tunnel are always a hit with Ethan and I could honestly watch the penguins all day long. 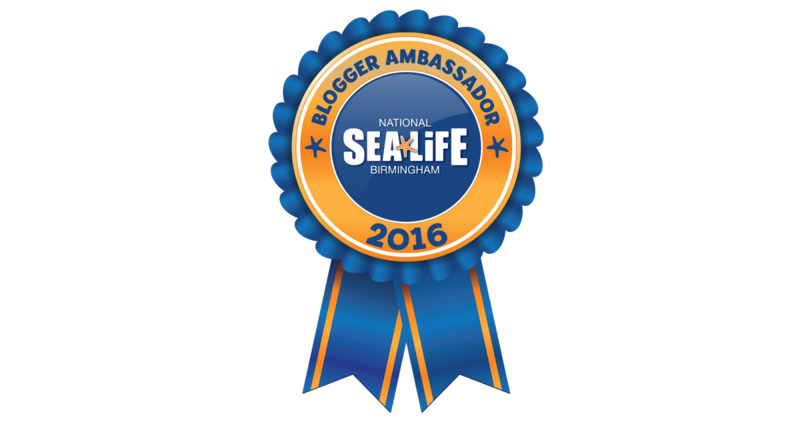 Find out more about Sea Life Centre Birmingham and the Father's Day special offer here. I'll be sharing more news and updates from our Sea Life Centre trips this year, but in the meantime, why not take a look at a couple of my past updates? 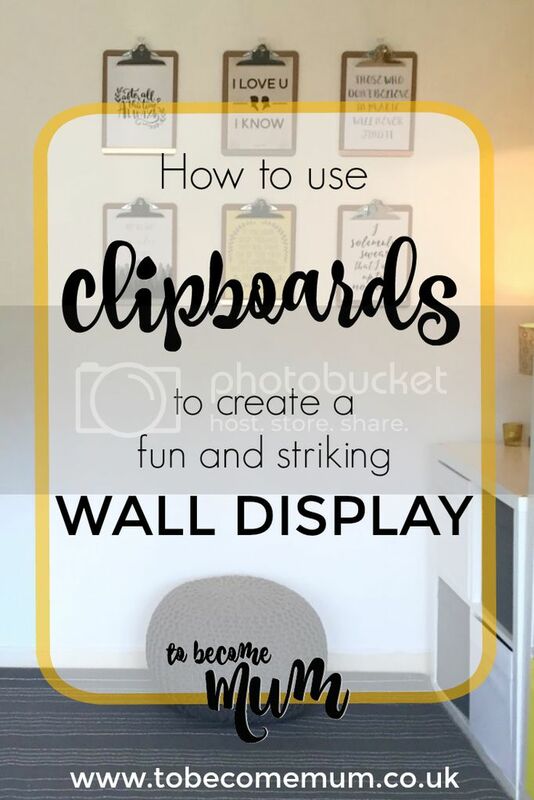 You may have spotted our new wall display in our new look lounge already, but I wanted to share it as a separate post as I think it's a really fun idea. 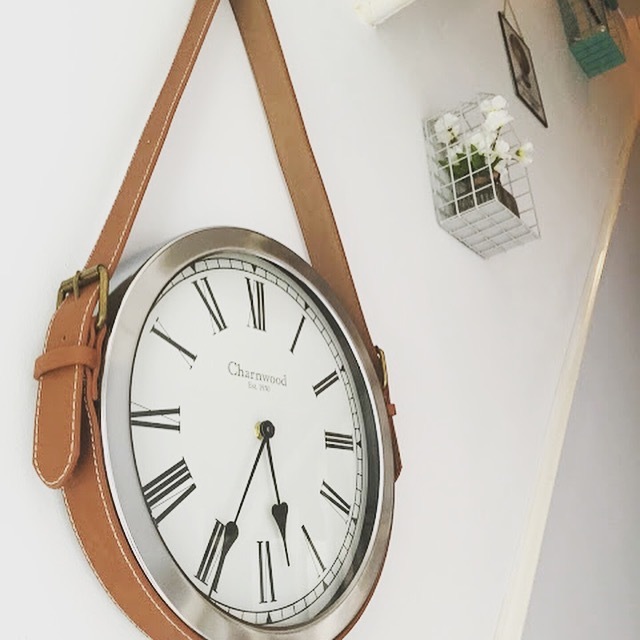 I love quick update ideas, for when you have a few pennies, need a bit of a refresh or want to tap into a new trend or the style of the season. 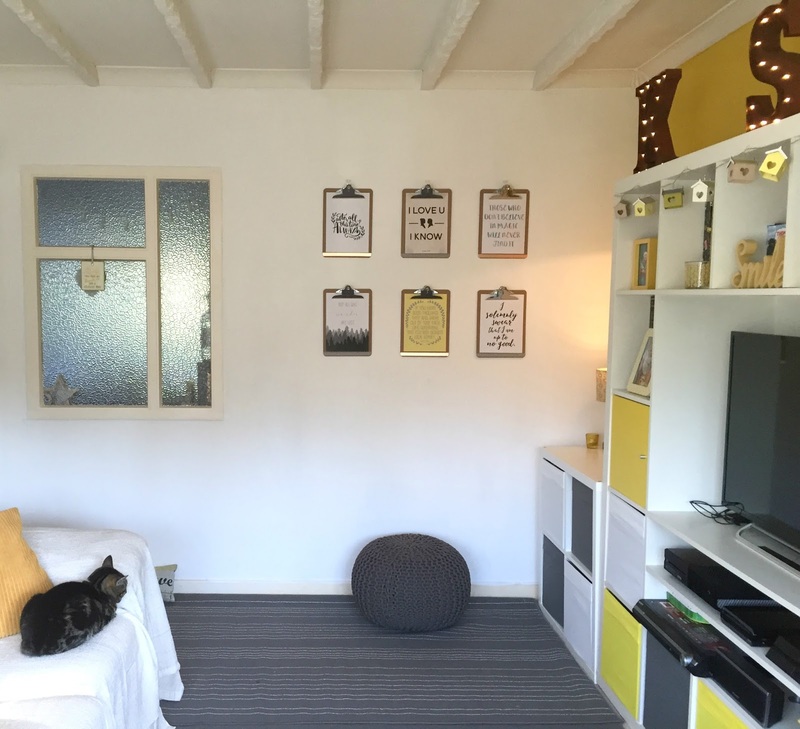 When planning our living room makeover, I took lots of inspiration from magazines, Instagram and Pinterest too, to look for different ideas or find examples of the ideas in my head. One thing I had seen in a few places was about using clipboards to display items. 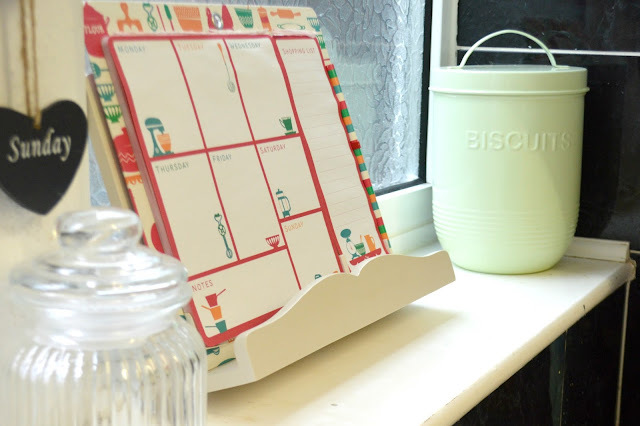 From takeaway menus to reminders, calendars to to do lists, clipboards are a practical idea as well as looking fun when hung from a hook or on the wall as part of a display. I ordered ours from Amazon and opted for the wood effect kind, with big chunky steel clasps. We then hung them, three in a row, two rows, on a white wall. My plan is to display Ethan's artwork and things like that as time goes on but for now, we have some typography prints. I'm slightly addicted to a good quote and spent ages looking for designs of my favourite film or book quotes. I then had a look on Etsy and there's many different designers who sell prints as downloads only, so you can pay for a file that you can then print at home yourself. It's a much cheaper was of picking pieces of art and if you're supplied with a JPEG, you can even have the item printed via a photo print online shop like Snapfish or Photobox. To add interest, I used some washi tape (I love me some washi!) 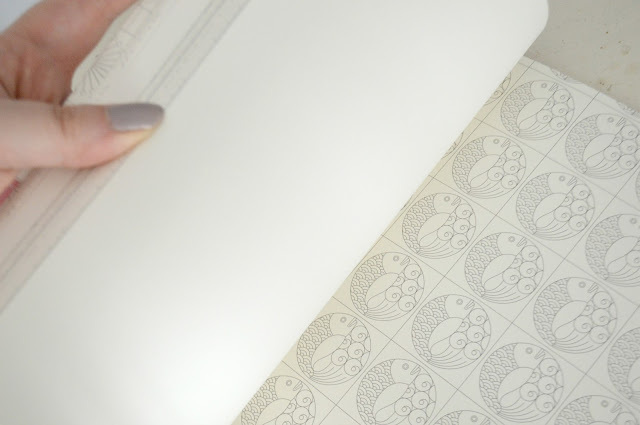 to decorate the bottom edge of each clipboard, opting for copper and a grey geometric print for an on-trend finish. I've also seen people completely cover their clipboards in a paper of their choice, which is another nice idea, if you are thinking of perhaps using the clipboards for photos or notes. Hubs thought I was mad when I first mentioned clipboards but they really make an impact and it was so simple to pull the look together. It's my birthday in three weeks' time so I indulged in some virtual window shopping. Why not?! I love buying gifts for others, which is why I love places like Not On The High Street as you can have no idea at all what to get and then suddenly you have lots of inspiration and so many ideas. I always find it a bit harder to think of things for myself. 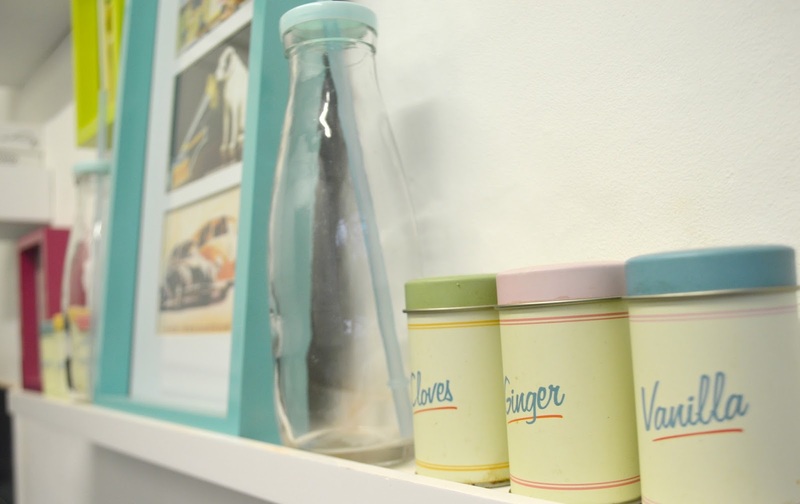 There's a few things that have caught my eye, from some of my favourite shops. 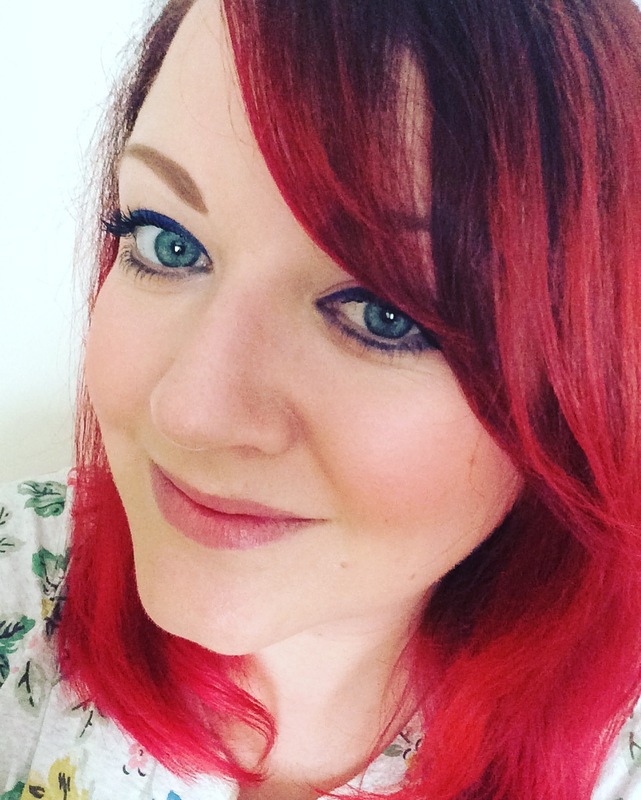 I'm generally really easy to buy for, I think - stationery, beauty treats, sparkly things, home bits and bobs, quirky nic nacs, brooches... I like a lot of things and appreciate the thought people put into gift giving. 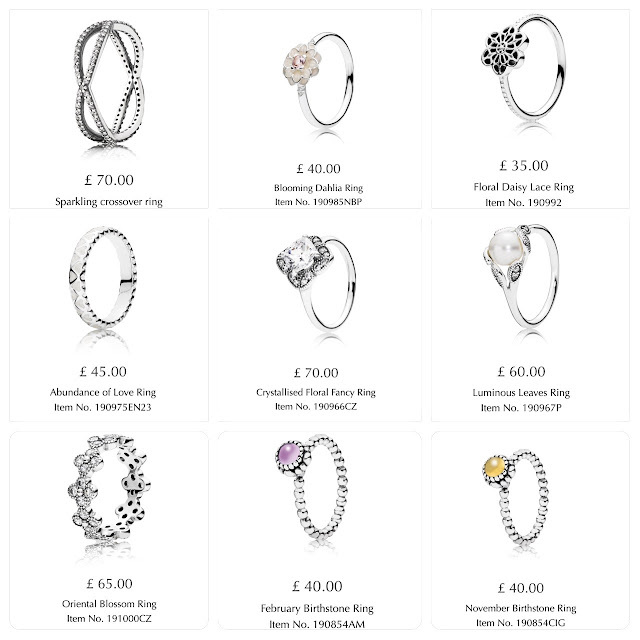 I love Pandora and they've launched so many new, beautiful rings. I definitely need to go in store and take a look to see what would work well with the birthstone ring I already have. The top centre, top right, middle centre or middle right are all beautiful and might be just what I'm looking for on my right hand, as a ring I had bought a few months ago broke and my finger looks bare without it. Then the others would work well as a stacker with the ring I currently have. I'm a tad obsessed with this place. 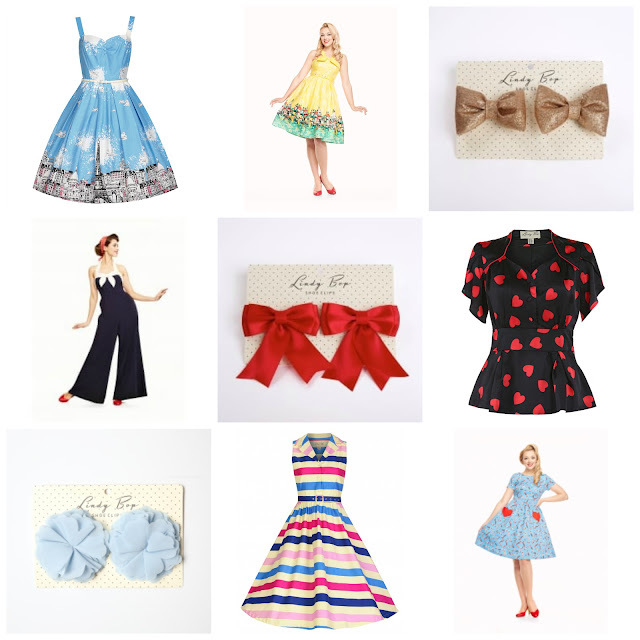 I just love vintage styling and fun prints and Lindy Bop has both by the bucket load - and at great prices too. I love all these dresses and the jumpsuit and blouse look lovely too. The bows and flowers here are shoe clips - how cute an idea is that?! The headband is from Not On The High Street and you can have any word and any colour glitter finish. LOVE! I love this red love band idea. 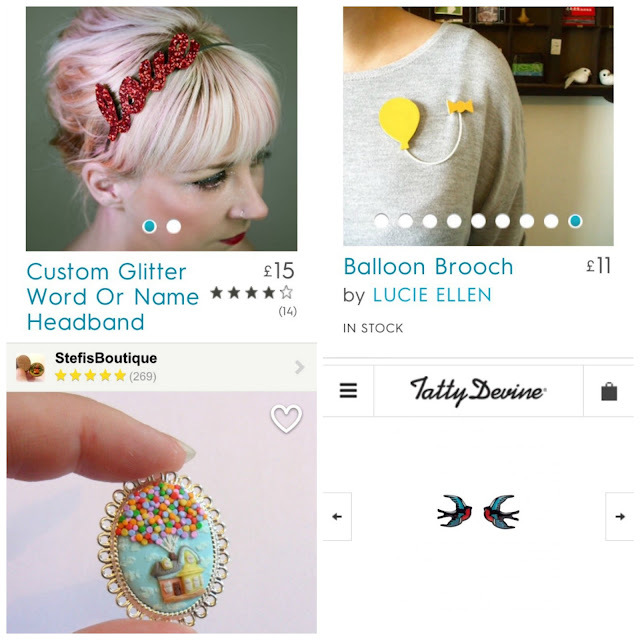 The balloon brooch is super cute (from NOTHS) and I came across the Disney Up inspired brooch on Etsy - just love the whimsy. And I've always liked Tatty Devine, and thought these swallow earrings were pretty lovely. 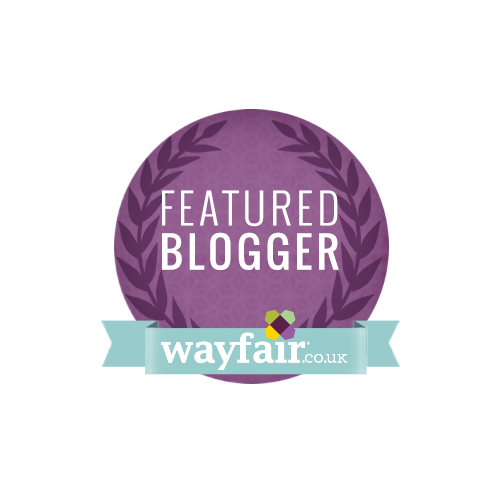 I'm excited to say that I have been featured as a guest blogger, in good company, on the Wayfair website this week, talking about combining different styles. 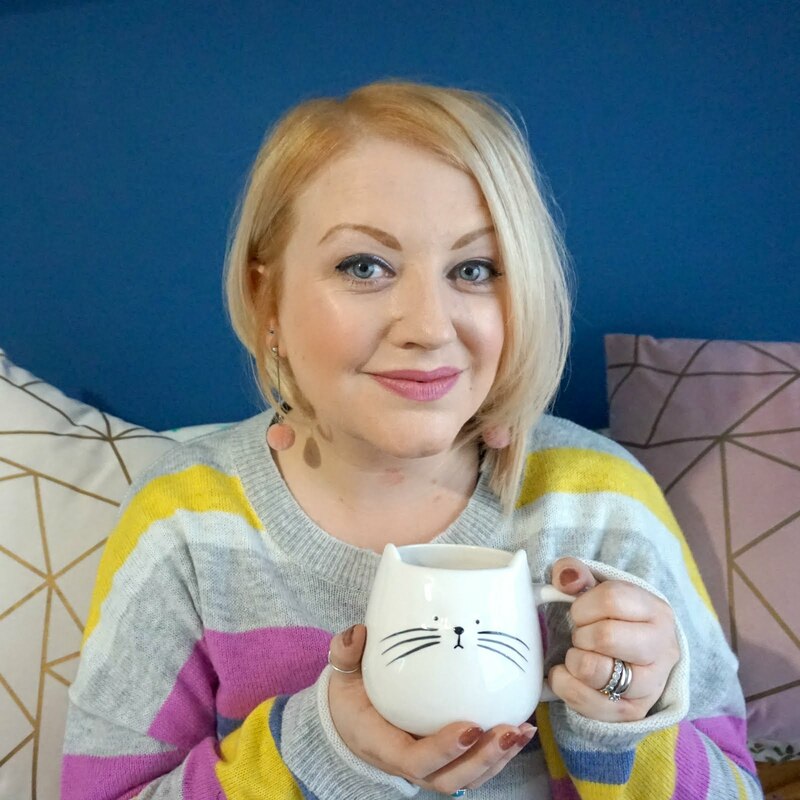 I love the website and to be talking about home and interiors, including our living room makeover, is such a dream opportunity. Scandi style is one of those looks that anyone can make work for any home. With its emphasis on clean lines and a crisp white base, we were first introduced to Scandi design by IKEA and now, most homes have at least one item that encompasses this simple combination of form and function. It’s easy to introduce a Scandi touch to your home; it’s all about choosing pieces that have a purpose and keeping the accessories understated. Traditionally, Scandi style works from a paired-back palette of pale grey, white and weathered or white-washed woods. And these shades are great for opening up your space and creating a sense of calm. 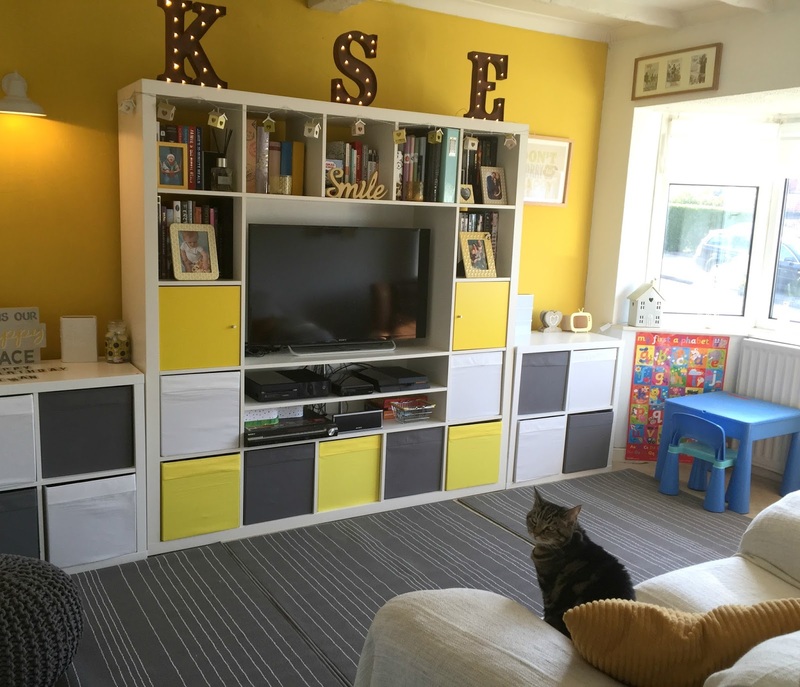 However, living in such a seemingly understated way can actually be quite difficult to keep up – particularly if you like ‘things’ or have little ones around, with all the ‘stuff’ they attract. 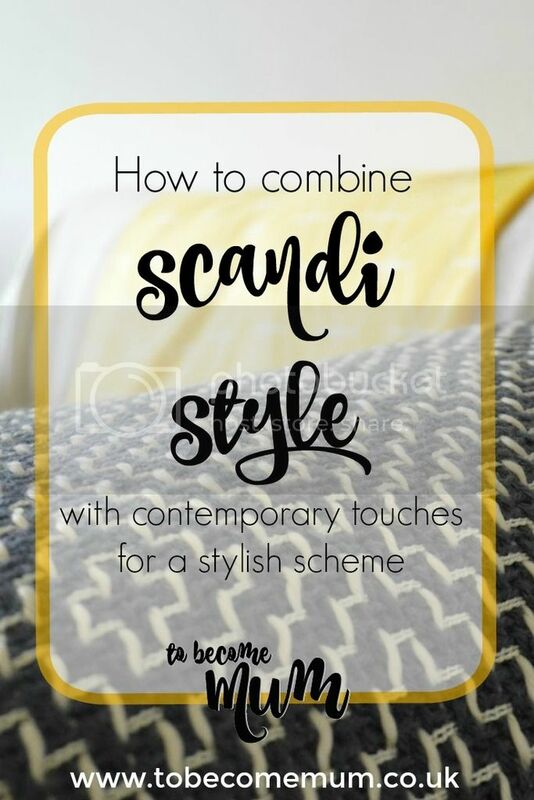 If you want to combine the effortless look of Scandi with some of the latest quirky and on-trend touches, here are my top tips for making this contemporary twist work for you. * White furniture is a good place to start - think modular bookcases and solid pieces. Low-level coffee tables are perfect, or you could choose a square design that offers more than one way of working, as multifunctional pieces are another key element of this look. * Functional, unfussy sofa designs – the simpler the form, the more your look will echo mid-century Scandinavian design. * Floating shelves – these will provide you with the perfect backdrop and create areas where you can store essentials as well as important items you want to display, from favourite prints, well-thumbed books and treasured mementos. Just search #shelfie and you’ll find plenty of inspiration on how to create an attractive cluster. * Layering – to soften the sharp edges and make your space welcoming rather than over minimalistic, add throws. Cover up chairs or sofas that may have seen better days with plain throws or drape a wool or heavy textured throw over the arm to layer up the look. * Splash of colour – break with Scandi tradition and be brave with colour. For me, this means having fun with paint. I decided to create a bold backdrop, using this season’s signature colour of high voltage yellow on one main feature wall, behind my white Scandi furniture. It packs a punch, but the flashes I’ve used around the room tie it all together. * Geometrics – a true contemporary trend, geometric patterns and forms combine with Scandi to great effect. It’s something about the matching of clear lines, so look out for cushion covers, throws and accessories that mirror this look. * Bring in copper touches – mixing materials is a great way to create depth in any room and copper is another trend that’s showing no signs of waning. Silver is a traditional pairing for Scandi but copper is a warmer alternative and can be incorporated through a few different pieces positioned here and there. Choose a copper candle holder, lamp or other accessory for interest and you’ll be right on trend. * Design your own displays – creative wall hangings are all the rage right now so don’t be afraid to try something different. To stay in-keeping with your typical Scandi look, line up pictures in a linear fashion – but who says you have to choose simple frames? 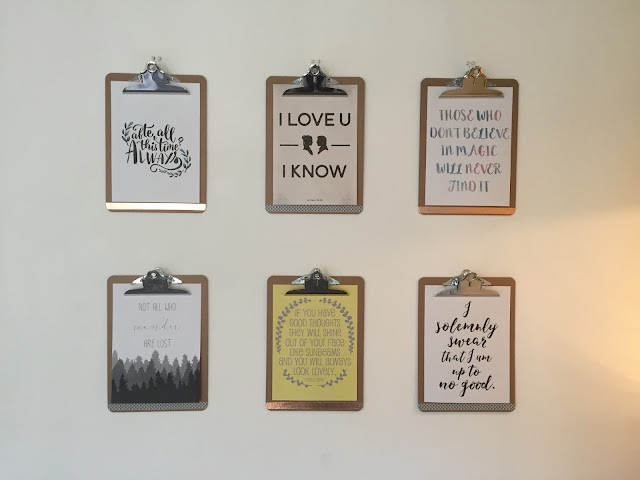 Take some wooden clipboards with chunky clasps and add your favourite photos or a typography print – very popular right now – for a different kind of display. Add some washi tape detailing, in copper or a geometric print, to tie-in with other accents in the room, and update your display with the seasons to maintain a fresh feel. Scandi is a look that translates for living spaces, dining rooms and bedrooms alike so why not break with tradition and use this as a base for a more vibrant, personal space. In case you've been swept up in the Euro 2016 kick off or the Queen's birthday celebrations, Father's Day is NEXT WEEKEND. No matter how early you start thinking about it or when you put the date in your diary, occasions such as this always seem to creep up on you. And the one thing I'm most likely to forget until the last minute is cards. I love making cards or designing a photo card to surprise my friends and family - and love seeing their faces when they receive it - and there's a quick, new and fun way to send a memorable card this Father's Day. 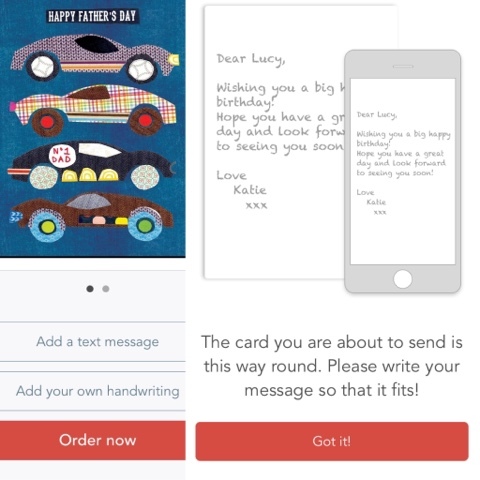 thortful, who describe themselves as the UK’s most thoughtful card company, have created an app which uploads images of special, handwritten messages or pieces of art your children make to any of their specially designed Father’s Day cards. It's such a simple idea but adds a really personal touch - the message can even be downloaded onto the front of the card. Your partner or Dad will cherish your child’s handwritten message for many years to come for sure. As soon as I heard about the app, I wanted to give it a go. The idea of quickly downloading an app and getting a unique card made is great if you're busy, or likely to forget the card altogether! At the age of three, Ethan's only just learning to make marks and although he can identify letters, it's a bit too soon to expect a full message to Daddy! But we have it a go anyway. 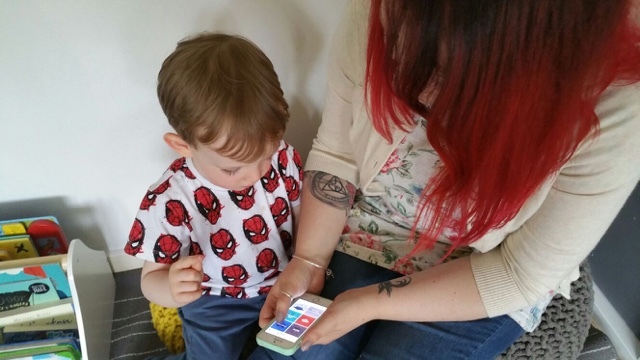 The easy-to-use app is perfect for older kids to write their own messages on Father’s Day. It only took a couple of minutes to choose a card and upload Ethan's image and I liked the choice of card designs that they offered. 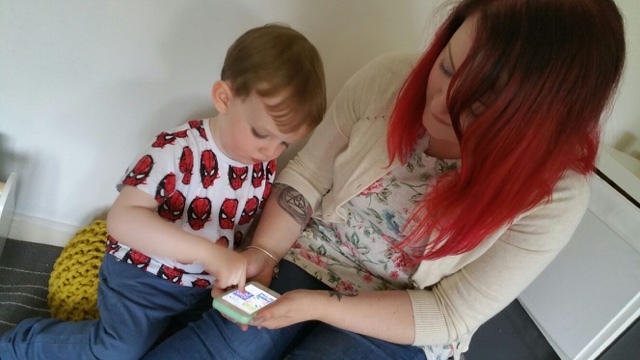 As well as creating fun and unique and cards, thortful is also completely hassle-free as cards are delivered straight to their door for you to give to your loved one. So, if you're yet to think of what card to get for your dad or partner for Father's Day this year, why not hop on your phone and give the thortful app a go? I have a couple of 50% off codes so if you'd like one, comment or message me quick and I can share them with you if you're quick!